Check out these Rose Gold Mother's Day Tees for $14.99 (Retail $29.99). 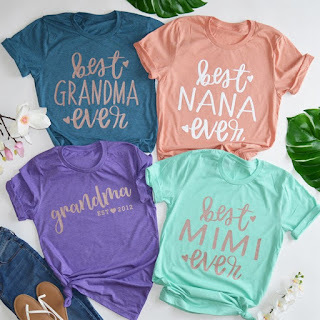 These Grandma tees are the most comfortable tees EVER ! Made on the popular Bella tri-blend tee! SO cute dressed up or down and SO comfy you'll be wanting to wear it every day. These tees are ALSO made with our new ROSE GOLD SHIMMER INK and are such great quality! We know you will love them just as much as we do. $3.99 for the first item and $1.99 for each additional item. US only. Ships no later than Wed, Apr 18.